To help you with your search, browse the 2 reviews below for assisted living facilities in Cairo. On average, consumers rate assisted living in Cairo 5.0 out of 5 stars. Caring.com has helped thousands of families find high-quality senior care. To speak with one of our Family Advisors about assisted living options and costs in Cairo, call (855) 863-8283. Cairo is a small city with a senior population of around 1,500 that is located 30 minutes north of Tallahassee, Florida. To accommodate these seniors, there are nine assisted living facilities in the area. Regulated by the Georgia Department of Community Health, these facilities are known as assistant living communities or personal care homes. The difference is the number of residents in each type of facility; the former houses 25 or more people and the latter two or more people. Both types of facilities provide room and board, medicine administration, grooming, meals and scheduled activities. The city of Cairo is home to world-class medical facilities, including Grady General Hospital, in the event of medical emergencies or illness. For rides to and from medical appointments and for other outings, the Southwest Georgia Regional Commission operates 76 vehicles across 13 counties, including Grady and the city of Cairo. Services are provided Monday through Friday at discounted fares for seniors. Special reservations should be made a week in advance. The cost of living in Cairo is six percent lower than the Georgia average and 12 percent lower than the national average. Seniors in Cairo may find it easy to budget for groceries and other services. Cairo has an array of community resources for seniors, including the Southwest Georgia Council on Aging, an organization that helps improve the lives of seniors in the area, as well as one senior center. Cairo is extremely hot and humid in the summer with average highs around 92. This weather may be difficult for seniors who have health issues or those who can’t tolerate the heat. Winters are mild with average January lows around 39. Crime rates in Cairo depend on the type of crime. Ranked on a scale from one (low) to 100 (high), property crime is ranked 41.9, higher than the national average of 38.1 while and violent crime is ranked 19.3, lower than the national average of 31.1. Most assisted living facilities have security measures in place to protect their residents, but seniors may still want to know the community keeps the property safe and secure. Assisted Living costs in Cairo start around $0 per month on average, while the nationwide average cost of assisted living is $4,000 per month, according to the latest figures from Genworth’s Cost of Care Survey. It’s important to note that assisted living rates in Cairo and the surrounding suburbs can vary widely based on factors such as location, the level of care needed, apartment size and the types of amenities offered at each community. 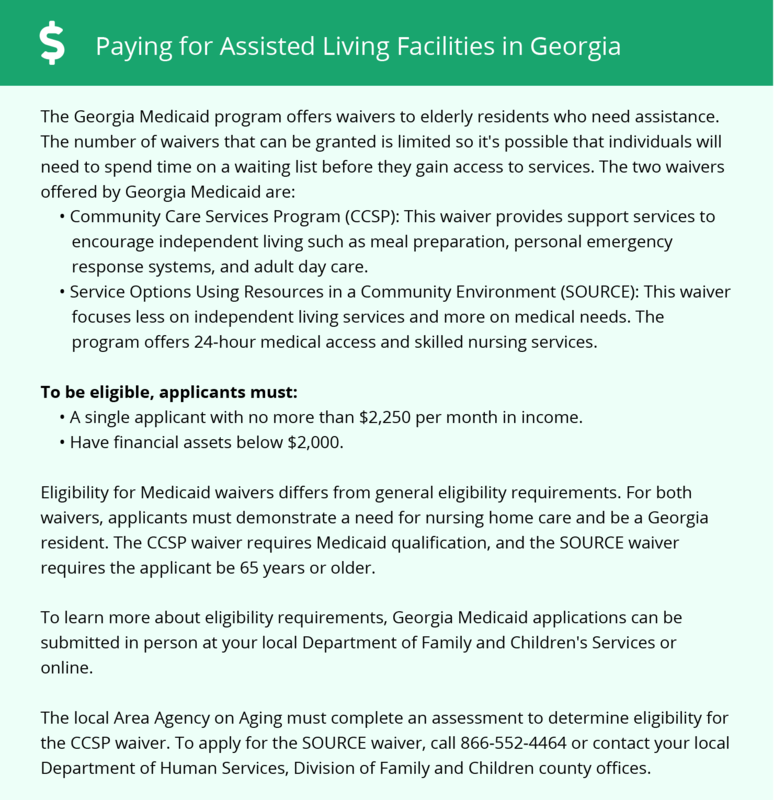 Seniors who need help paying for assisted living care may qualify for two state Medicaid waivers. The Service Options Using Resources in a Community Environment (SOURCE) waiver and the Community Care Services Program (CCSP) are available for low-income seniors who live in a personal care home with at least 24 beds. Neither program offers payments for room and board, but families may supplement the waiver payments. Cairo and the surrounding area are home to numerous government agencies and non-profit organizations offering help for seniors searching for or currently residing in an assisted living community. These organizations can also provide assistance in a number of other eldercare services such as geriatric care management, elder law advice, estate planning, finding home care and health and wellness programs. To see a list of free assisted living resources in Cairo, please visit our Assisted Living in Georgia page. Cairo-area assisted living communities must adhere to the comprehensive set of state laws and regulations that all assisted living communities in Georgia are required to follow. Visit our Assisted Living in Georgia page for more information about these laws.